Covered in a vast area with a flourishing garden of trees, leaves and flowers, Nara Park is the place which proudly stands as the symbol of Nara today. And rightly so, since the park holds a lot of Nara in it. You can easily spend a day here by visiting one or all of the several UNESCO World heritage sites namely the Kofuku-ji Temple, the Todai-ji Temple and the Kasuga Grand Shrine, playing with the gentle deers (easily crossing 1000 in number) roaming around freely in the locale or by simply losing yourself to the tranquility of the innate worlds. Dear - Oh - Deer! After reading a lot about deers and how it is one of the most unique experiences of Japan, one of the major draws in the Nara Park who enjoy a lot of attention from both the tourists and the locals alike, and how sacred they are on the blogs of the Nara bloggers, I was anxious to spend some time with these innocently docile, and much loved creatures and fulfill my wish of stroking their furry bodies, right from the very day I had stepped in the town. I finally got my chance, on the morning of Day 5, thanks to our friend cosmos. hence deers in Nara enjoy a sheltered status as godly messengers today. After a brief introspection of the park that had a lot of deers roaming around freely; I immediately got down to work -- of finding a deer for myself so that I can run my hand through his fur. Little had I known then, what a tough job I had taken at hand. the deers are quite smart not to give you any unwarranted attention! I approached them vying for some of their attention only to be disappointed as many of them simply went about minding their business (of food!) while some others just shied away. The real activity started, when cosmos bought a packet of deer food – ‘shika senbei’ - from a shack nearby and handed a major portion of it to me. With the crackers in my hand, I suddenly became the center of their attraction! All their eyes, which were ignorant till a few minutes ago, all of a sudden turned ingenuously pleading. I was the one, now being chased! A Deer bowing at a boy's food-filled fingertips! So much for fun and this lasted till the crackers lasted or perhaps just a little more after that. After I was done with the crackers, came the tougher part of convincing them that I now had no more. Generally, flashing off both your empty hands does the trick and influences them that there is nothing more left in your pockets. That's exactly what I did and that's when they left tagging along to go ahead in their pursuit of finding someone else. Empty handed again, I started scampering around the park in the hope of finding a deer that was lazy enough to stick to his place and not scurry away while I fiddled with him. My joy knew no bounds when I finally got lucky! Messengers of God... Messengers of Love, harmony, peace and purity. A few experiences in life are indescribable. Running after the deers, feeding them with their cookies and... stroking their backs were definitely some of them. Each moment spent in their playful, and affectionate company was enough to give a gentle call to the innocent child within. The same child that lights up your path to the beauty that you have always been, the beauty that reflects in the essence of your very being, the simple essence... that is sometimes also known as, 'The Message of God'. This is AWESOME!!! The spotted ones look like fawns, baby deer? Why does the boy have a mask on, did they make people wear them? Will you make a scrapbook of this joyful day? How tame and docile those deer were. I would have loved it there. the first picture is so inviting me to be there and get some deer food and be their center of attraction too :) have a great weekend, Arti. @Arti Good morning. First of all thanks a lot for sharing another awesome post.Nice to read about Nara Park , Awesome photographs of Deers. The deer look very well fed! I wonder if they ever eat grass? Such a nice place. Nice write up Arti. Nice captures! 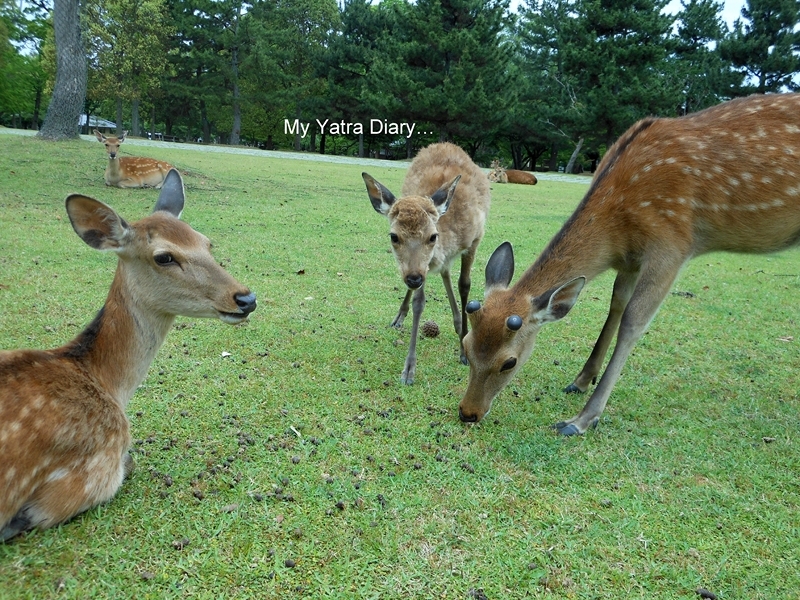 My blogger friend said when she saw these deers.
" 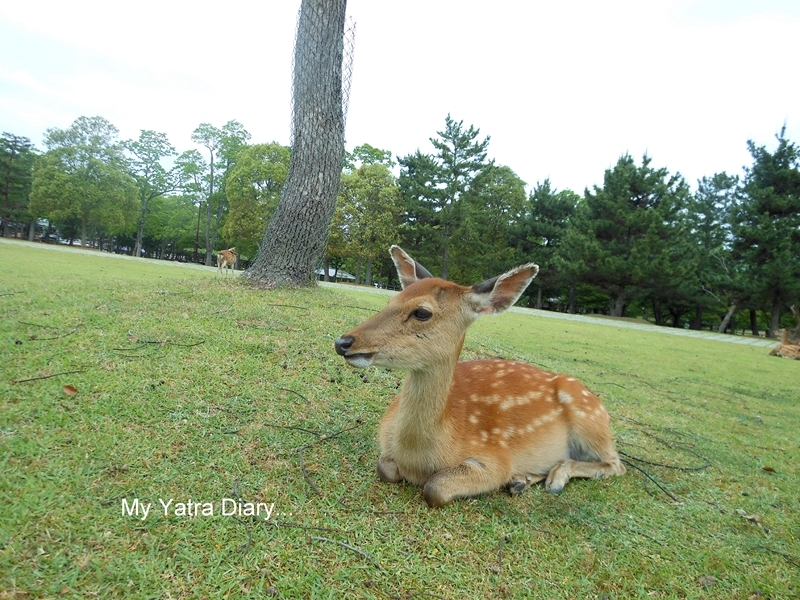 I want to be reincarnated a deer in Nara." This deer park is just amazing. I've seen many pictures of it before and I never cease to be amazed by the deer and the respect with which people treat them. What an amazing experience and so memorable, I would also have longed to do this. The deer look very sweet! Sweet animals who know what to expect! I'm glad yo got your wish, Arti. It's snowing in Breckenridge, CO, today, and I await my own little "dears" (my Grandchildren). The deers! How cute and lovely the are. It was so nice to read about your experiences with those innocent creatures. Great story, love the pics. Wow..I love watching the deers too, and you've gotten some great shots of them! Wonderful.. Deer is always deer to every one..Like these lovely pictures Arti.. Informative and fun post! Love the little deeries! Fabulous! Through your eyes, the deer look very different and more interesting, even though I am familiar with the deer. Many students remember their trip to Nara with the sweet memories of the deer, running after the deer and being run after by the deer. "Messengers of God... Messengers of Love, harmony, peace and purity." Amazing to see the deer. Beautiful clicks! @Ginny: Might be, Ginny. Not very sure on the baby deers. About the mask, it’s a self precautonary step some people take to prevent spreading of infections. 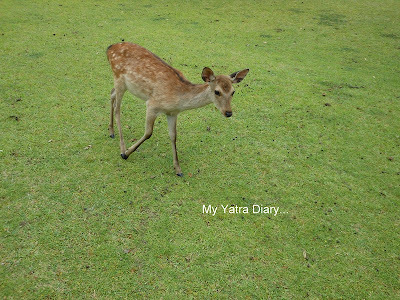 This is not specifically related to the deers and can be commonly seen in the whole of Japan. @Stewart M: They do, Stewart. But with all the love that people are ready to shower on them, I don't think many really need to eat it for their living! Hi Arti... this is a beautiful post...just takes us to our childhood also while we read about you playing with the gentle deers. How beautiful your words are! It was simply sweet to see the innocent joy on your face while playing with deer. 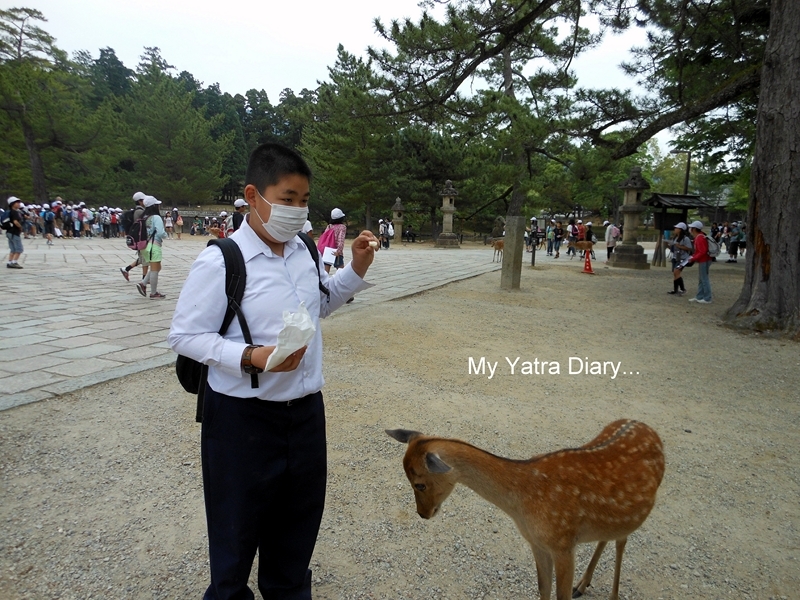 It was when I bowed out of my part of "Welcome Arti" to Nara project! It is quite lucky we Nara bloggers are all friends and you knew all of us through our blogs. We decided who would do what and when beforehand. It was very much fun cooperating to make your stay in Nara and Kyoto as meaningful and fun as possible. 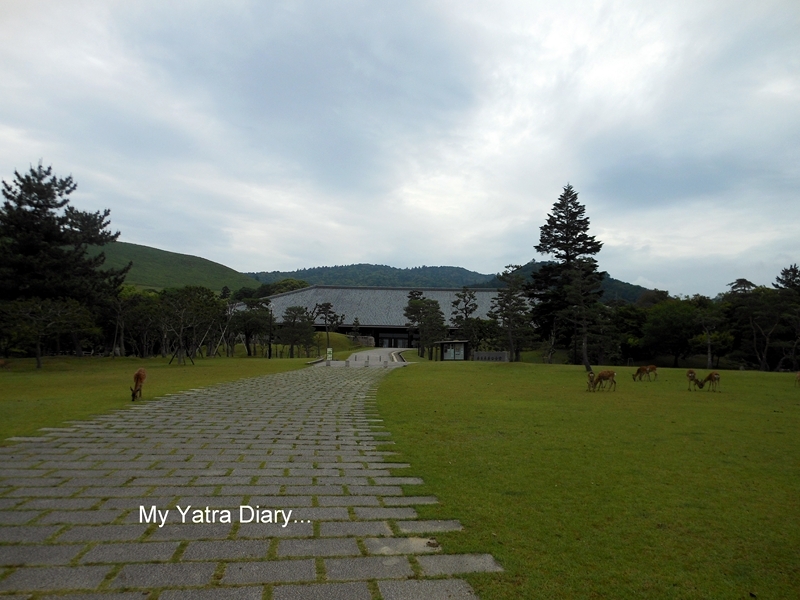 Reading your post now, I am so impressed and happy again that you are such a marvelous narrator of Nara. Thank you again for keeping a good company, Arti. How wonderful to be able to feed the deer. So tame and beautiful. What a beautiful experience Arti. I already told many of my friends about your last post on tea ceremony. I am so loving this series.Have a lovely week ahead. Wonderful creatures, Of beauty and peace and harmony. Nice to see so much of wildlife conservation taking a priority there. 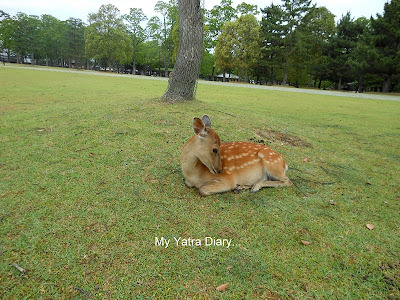 Nara park looks interesting and the day with deer all around must have been so much fun. Pictures are great.. Thanx for taking us around..
so interesting!! we have deer in our back yard...they flee at the slightest of sound..I cannot even imagine them being so tame. So sweet! I have read about the dder at Nara on Keiko's blog (I saw your comment on one of her posts, so I know now that you read her blog). But it is lovely to read about your experiences as a tourist at the park. We see deer often when we're in Oregon, but they are wild...I can't imagine how lovely it be to pat them and feed them! Oh, wouldn't that be amazing to see the gentle deer roaming around? I just saw some at my mother-in-laws in the mountains. They are special animals. I wanted to answer your question on your comment. All the goodies that Nel baked for Christmas are made with eggs. They look so good, and I wish she would bake a few for me too. Nice. I too used to be excited about deer till I ended up studying engineering at a campus where deer used to stare at me through the window every morning. Over the 4 years, deer became common place to me, though taking away nothing from their beauty and grace. That looked so fun to be surrounded by all that deer! 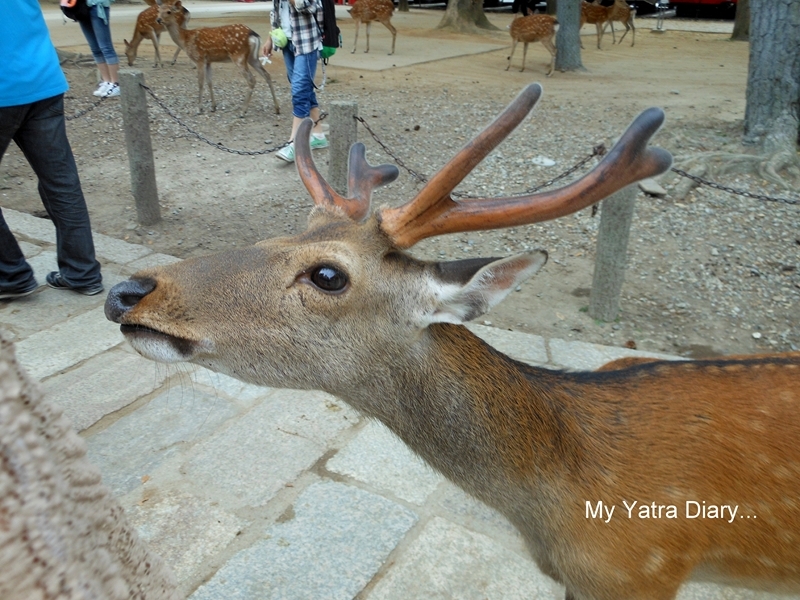 I have read about them and was one of the reasons I wanted to go to Nara. So glad you got to experience that and share it with us. It looks a bit unnerving to be surrounded by all of them but seems well worth it. Beautiful creatures! Captivating pictures of the gentlest of creatures ! Must have been so delightful to be strolling in the Nara Park. No pics of you feeding these lovely creatures? I love watching the calm and tranquil nature of deers and this park loos just divine! I am scary when I am surrounded by many deer, especially males with big horns. So I don't carry sika-senbei. I thought expression of messenger of God is right. Lovely pictures , Deer is always very dear . Up close and personal with deers. An experience worth living for, yaar.. Was it scary? I mean, I know they are not wild but still..
Well in my town you don't have to go to a special park to see the deer. They are laying right in front lawns and walking the streets. It is so common place for the residents there. I will visit and friend and look out their big picture window to see a big buck laying in their yard. But with all this comes problems. They bring cougar into town stalking them. They have attacked many dogs. You have to have a 6 foot fence if you want any flowers or garden. Too funny cause I live in the forest and I have no deer problems with my flowers. I do have a high fence around the fruit trees and vegetable garden. The deer in town have become tame and unafraid of people. I do have one doe here who has had her babies near our house for 3 years and I could get within about 6 feet close to her when she and her off spring are here when we arrive back from California, but soon the leave as we are present again. The deer is such a beautiful animal. The animals at this park seem to be so comfortable in human company. :) I'd love to pat one but I've a been a little too scared after I watched a certain video on Animal Planet. all praises all around .... i guess i am too late .. yet i would say it is always a pleasure reading ur posts coz they are a combo of few words and gr8 image captures , including this one !! Your posts on Japan are adelight to read.I wonder if deers all over are as friendly,here we only see them at a distance. 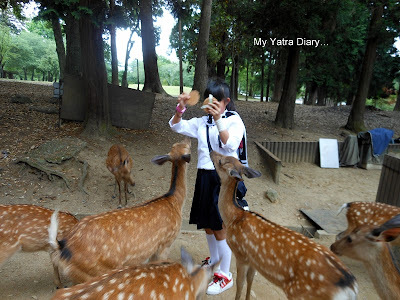 The pictures have captured the beauty of the deers wonderfully.. Great reading about your posts on Japan.